"Walkin' After Midnight" featured a central theme tonight that had everyone's storyline connected: romantic feelings. 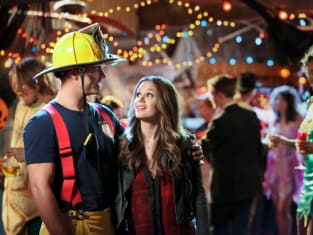 There was Lemon realizing she had feelings for Lavon, George confessing he still wants to be with Zoe, Annabeth fake dating Lavon in the hopes that they would end up together, George meeting a new woman, Zoe and Wade continuing to sleep together and the possibility that Lavon and Ruby will reconcile. Phew! That's many different romantic angles to play into in one hour - but it worked. I'll start with Annabeth and her feelings for Lavon. I have to admit I didn't like this at all until I realized that the only reason it was being shoved down our throats was because it was the catalyst for Lemon to realize that she still had feelings for Lavon. When we see jealous Lemon that usually means that she is going to be mean and unreasonable, that wasn't the case tonight. I call that character growth. Lemon helped Lavon see reason in lying to get votes; that isn't who he was. Though her motives may have been misguided by her feelings, the intention was pure. Lavon has always been one of my favorites because he is true to himself and what he believes in; that is what Lemon sees. I was extremely pleased when he fixed made right with his lie which in turn caused Ruby to apologize to him as well. Ruby also showed some major growth in the episode. In the past I have said that Ruby is going to be the reason for other characters to grow and I figured she would stay fairly static. I was wrong. Ruby apologizing to Lavon for playing dirty means one thing: this is the start of a love triangle. Lavon/Lemon/Ruby and, since Annabell likes the mayor, I guess it's now a love square with Lavon/Lemon/Ruby/Annabeth. Looks like George isn't the only man in Bluebell with a bunch of ladies swooning over him. We've all learned to love George for being such a gentleman and tonight he had ladies coming at him left and right. He was also Zoe's mysterious house guest and this led to some heavy scenes between them. Unfortunately, this was my least favorite part of the episode. I thought it was really ridiculous to have George sleepwalking and pretending that he and Zoe were dating just so it could come out that George still had feelings for Zoe. I don't need to be told that those feelings still exist, it's obvious. I did become more involved with George's character when his new love interest was introduced at the end of the episode. She's the kind of girl who will give George a run for his money and I look forward to seeing this new dynamic. Wade tonight made me especially happy. I really love him in a mature role and not being the jerk bartender. For the past two episodes Wade has been such a lovable guy and what Zoe deserves. My favorite scene took place when he said he was going to enforce their rules and pushed George in the water. Zoe was being hypocritical and I am very glad he confronted her about it. It needed to be done. Right now I want Zoe and Wade together, George can go be happy elsewhere. The only other thing I disliked was that Rose wasn't in another episode. I love Rose. She brings such an innocent and adorable aspect to the show that keeps it fresh. 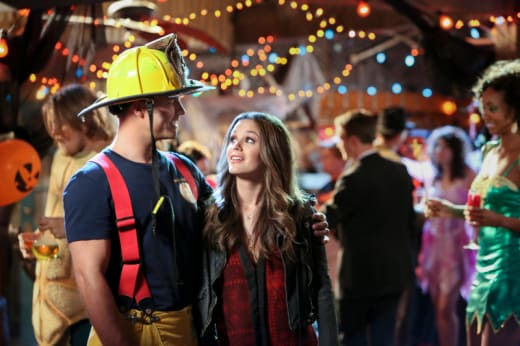 Hart of Dixie doesn't return until November 13, so I hope that she'll show up in that episode. If not, she'll definitely be in the November 20 episode because that is when McKayla Maroney will be guest starring as Rose's best friend. Overall tonight was a pretty decent episode, not the best of season two but it was good. I can't wait to see how the election turns out. My vote is for Mr. Lavon Hayes.